Dad called around 11'o' clock to let us know. Only Mom has already taken Jonny to his baseball practice and of course Matt isn't home from college yet, so I was alone to get the big news. Wow what a story! I can't believe it took me so long to get around to reading it and still two weeks after reading it, it plays in my mind. I am wondering if the idea of the moon being pushed nearer to the Earth is disturbing me more because I was taken in by the Mars spoof where the dodgy emails mentioned it being right next to the Moon. I am jumping ahead, for those of you who are unfamiliar with this fabulous book the story is based on a diary by Miranda. Miranda is a normal teenager American girl, with a lovely family and basically just like everyone else. She is looking forward to watching the meteor crash into the moon, just like everyone else. A party atmosphere has occurred all over the world. What becomes unexpected, is that the Moon is shifted off it's axis and is pushed nearer to the Earth, causing worldwide destruction in the form of tsunamis, earthquakes and erupting volcanoes. Miranda and her family slowly watch the world they knew disappear as it continues to disintegrate. The sky turns grey, food and drink becomes scarce and electricity and gas disappear. The weather deteriorates into permanent winter and lines of communication with the outside world disappear. It becomes a world where every family is on its own in a bid to survive. This is a very powerful story and deeply moving. I found it very difficult to put down and found myself visualising how life would be in a similar situation. 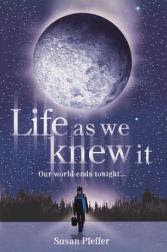 The story reminded me a little of the programme Threads which I was made to watch in secondary school about how life would be after a nuclear explosion - it scared me for years. This book was scary and so believable, but full of passion and hope as Miranda's family refused to give up. Personally I thought there might be more violence in a situation like this, where people would actually steal from each other if they knew they had food, but this wasn't an issue in the book. Within the space of a year, you see Miranda and her younger brother Jonny grow up very quickly as they learn to survive is such hostile environments. By the end of the book, you are desperate for a miracle and luckily that happens. Susan Pfeffer got the idea for her novel by watching the movie Meteor. She stated that "it got her thinking about how the people who have the most to lose if the world comes to an end are kids," and wanted to see how her characters would cope with a situation that was out of their control. Susan has her own blog which you will find here. This is one of the those books that is definitely a keeper and one I now need to buy, though I have managed to purchase Susan Pfeiffer's second book The Dead and The Gone for £2.00 from Red House (no P&P). This looks at the situation from another teenager's perspective. For the teenage market it is definitely up there with The Hunger Games and The City of Bones for me. If you like films like Armageddon and Independence Day, you will love this. Now I know other people have read this, but for some reason my Google finder can't find any links, so if you have reviewed it, let me know and I will add a link to your review here. My google reader isn't finding links these days, either! Grr. I do think Nymeth read this one awhile back, but I'm not sure. So did everything in this book feel plausible? Scientifically, I mean. I don't know much about meteorology and what sorts of weather things the moon effects. Yep Amanda, I did read it earlier this year, and I loved it. I'm glad you did too, Vivienne. I'm actually hesitant to pick up The Dead and the Gone, though...not because I think it won't be good, but because this one gave me nightmares and I'm not sure if I'm ready for more! A book that moves you so much it's still with you a few weeks later is a must read! This one sounds fantastic! Amanda - I am not very wise on scientific aspects, but it did seem plausible to me. Katrina - go for it, you will love it. Nymeth - it was the best and I just have to read the next. No nightmares here though. Blodeuedd and Bermudaonion - you do need to read this one. It is fabulous. Missy - thanks for the link I shall add it in. Oh, I'm so interested in this one! I just finished The Hunger Games two weeks ago and How I Live Now by Meg Rosoff last night, so I'm really on a roll with these dystopian and alternate reality books. This one sounds great! This sounds right up my alley, love your review and I enjoyed all the films you mention so this one is definitely going on my wishlist. This one looks soo good! I have to stop reading your blog! I went ahead and bought this one, and I cannot wait to read it, but I also bought another one you recently read, and they both sounds like amazing reads. Can't wait. is there a fourth book coming out?